Although it is remote, a visit to Big Bend National Park is definitely worth the trek. Where else can you find amazing mountains, clear, starry night skies, and beautiful desert landscapes? For these things and more, Big Bend National Park has it all. It’s a whopping four hours from the nearest airport (in Midland, Texas), but it’s worth the long drive to see one of Texas’ most beautiful destinations. While I always recommend taking more than just two days to see the park, you can definitely have a rich experience in one weekend. Read on for my suggested itinerary for a short trip to Big Bend National Park. The nearest airport to Big Bend National Park is Midland, Texas. You can also arrive from El Paso, Texas. You absolutely need a car to properly explore Big Bend. You can either drive (if you’re from Texas or New Mexico) or you can rent a car at the Midland Airport. I rented with Avis and spent ~$20 per day, plus gas. You do not need a four-wheel drive unless you plan to do some backcountry/off-road camping. Gas costs a bit more than average in these rural areas. In March 2017, it was $2.25-$2.50 per gallon, depending on the town. Avis had an option to pre-purchase a tank of gas (so we wouldn’t have to refill) at $2.17 per gallon. It ended up being a really good deal. If you enjoy the outdoors, you can camp in the park for $14 a night. We spent two nights in the Chisos Basin campsite, which was centrally located for a lot of the park’s most beautiful hikes. This campsite has grills available for cooking, as well as restrooms with running water. There are no showers, however. If you’re not into camping, you have a few other options. We spent one night in Chisos Mining Co. Motel in Terlingua, which is a bit over an hour outside of Big Bend, and it cost ~$60 a night for the economy room. For a more convenient (and more luxurious) option, the Chisos Mountains Lodge is located right next to the campsite, and it costs ~$120 per night. To avoid the heat, plan to visit the park between the months of October and May. This way, you won’t get stuck in the extreme heat of West Texas during the summer. Big Bend’s weather is very dry, and ranges from chilly in the night to scorching hot during the day. I recommend bringing a few layers that you can put on and take off easily. Otherwise, pack like you would any other camping trip, and don’t forget to bring a camera! During the daytime, you’ll be fine with shorts and a t-shirt/tank. In the evening you’ll want sweatpants and a jacket, especially if you are planning on camping. Bring sunglasses, plenty of sunscreen and chapstick, a hat, and a water bottle. If you stay in the Chisos Basin, you have two options for food: you can bring/buy food to cook, or you can eat in the lodge. Meals in the lodge run from $9-$15, while food items for cooking in the convenience store run anywhere from $2 for canned veggies to $10+ for meats. There are also various snacks available for purchase in the store, which was perfect for me because I get super hangry when I hike. Having ample water is critical, as the air and the land are quite dry and you can get dehydrated easily. Wake up nice and early to depart Midland for Big Bend. If you leave around 8 AM, you can arrive in the park by noon. On the way to the park, there are a few detours you can take to see some Texas ghost towns. The one we stopped at was called Terlingua, and surrounding the original ghost town there is a small cafe and a few locally-owned shops. You can stop here for lunch once you arrive in the Big Bend area. Once you’ve set up your tent or checked into a lodge in the park (my recommendations are in the “Logistics” section below), there are a variety of hikes that you can go on. For stunning views of the Chisos Basin, I highly recommend Lost Mines Trail. This is a moderately steep trail that takes 2-3 hours on average and overlooks the amazing rock formations below. Watching the beautiful golden sunset over the valley was something I’ll never forget. If you’re only going to hike one trail in the park, I recommend this one. After you’ve completed your hike, make sure to stop by the Chisos Lodge to grab dinner and a draft beer from Big Bend Brewing Co (I recommend the lager, it was awesome). Go to the restaurant before 9 PM, because after that there is no other place to purchase food nearby. As they say, “half the park is after dark.” On clear nights in Big Bend, you can go stargazing and see the Milky Way with your bare eyes. To best see the stars, drive down the road you’d take to exit the park, pulling off into a paved shoulder area in the road (there are many), and letting your eyes adjust to the dark. You can also get an app called Sky Guidewhich will show you the position of the Milky Way at any given time of night. If you haven’t stayed up the entire night stargazing, wake up before dawn and head to Santa Elena Canyon for sunrise. Once there, wait at the overlook for the golden hues to appear on the canyon’s stunning cliffs. This is one of the most beautiful places in the park to watch the sunrise. Afterward, if you’re feeling adventurous, you can do a short hike on the Santa Elena Canyon trail. Once the sun is up, you can grab a quick breakfast at the lodge or drive through the Mule Ears area. For lunch, I recommend crossing the border into Boquillas, Mexico for some Mexican food and drinks. It’s perfectly legal and encouraged to cross the Rio Grande, as long as you cross at the border patrol station and you have your passport. We took a rowboat across the river for $5 and enjoyed some burritos and margaritas on the other side of the border, avoiding the early afternoon heat on a shaded patio overlooking the Rio Grande. Once you’ve crossed back into the United States, you can hike around the Boquillas Canyon area. In the evening, you can either return to Midland for your flight home, or you can do one more hike around the area for sunset. Either way, you should aim to drive back with some daylight left. The park’s roads at night are very dangerous, dark, and full of wildlife. There are several other activities I would have loved to do if I had more time in this area. 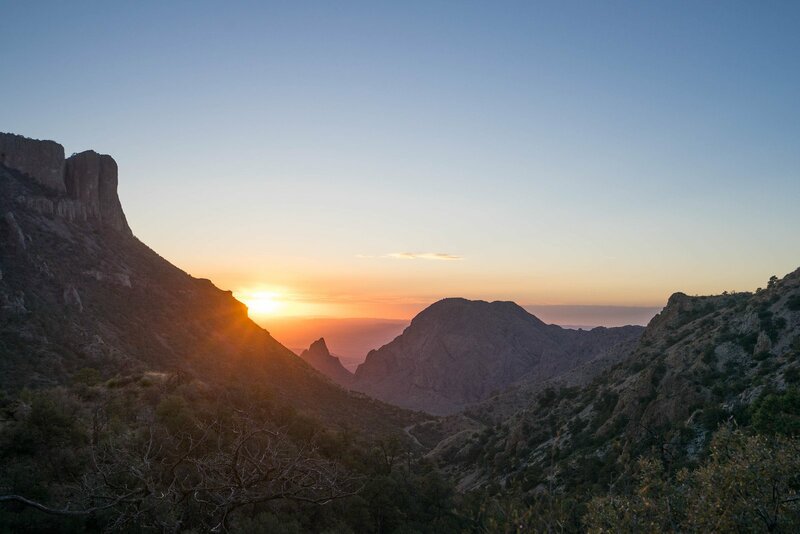 If you’re a serious hiker, there are some day-long and multi-day hikes that are worth considering: Emory Peak is a 6-7 hour hike to the highest point in the entire national park, and the South Rim trail is a 7-8 hour hike around the Chisos Basin perimeter. Some highly recommended shorter hikes include the Window Trail and Grapevine Hills. There are also various horseback, kayak, plane and helicopter tours you can book for a bird’s eye view of the park. Nearby, there are also some lovely West Texas towns and landmarks to explore. If you have extra time, it’s definitely worth seeing some of the strange, scientific, and stunning things that West Texas has to offer. As always, when traveling in a remote or unfamiliar place, I rely on World Nomads travel insurance to cover me in the event of a medical or travel-related emergency. After coming close to death in Thailand, I never travel without insurance, especially when doing adventure activities. Big Bend National Park is a vast, open, beautiful expanse of mountains and desert. It’s definitely worth the long trip to get there, even if you only have a few days. Although one weekend in the park is certainly doable, I suggest taking a few extra days if you can. There’s no place quite like Big Bend, and I’ll definitely be back one day to explore it even further. Have you been to Big Bend? Share your recommendations in the comments below! This post contains affiliate links to some of my trusted partners. Purchases from these links help support the costs of running this site. As always, all opinions are 100% my own. Your tips and insights are always so useful! We are considering a trip to Big Bend, and I remembered that you had recently gone. Looking up this article was one of the first things I did (second only to finding out how long of a drive it would be)! Great writing! Looks Incredible! I live in Texas and have yet to go!